The Spanish Chapel was originally planned around 1345 as the chapter room of Santa Maria Novella by Fra Jacopo Talenti, and was financed by Buonamico Guidalotti who is buried at the center of the chapel. 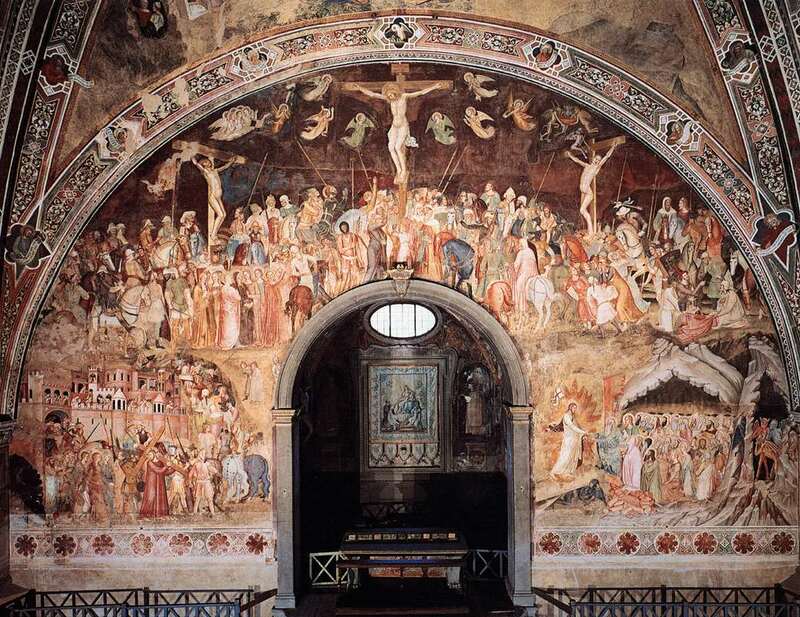 It is mostly known for the beautiful frescoes painted by Andrea di Bonaiuto a few decades later, between 1366 and 1368. This cycle is among the most unusual and vast of its time, dating just after the black death of 1348: The whole surface of the chapel is covered with images, including the vaults. Histories such as the passion of Christ, the deeds of Saint Peter Martyr, and the victory of the doctrine of Saint Thomas Aquinas are narrated in elaborate combinations because each wall shows different episodes, creating a summary of ideas and attitudes that were common in medieval art. The great wall on the right is dedicated to the Triumphant Church (in Latin also the Via Veritatis, meaning the way to the truth): Here for example the black and white dogs fighting against wolves symbolize the role of the Dominicans, whose habit has the same colors, fighting evil and specifically heresy. On the opposite wall Saint Thomas Aquinas defeats heresy and at his feet one can recognize an imaginary portrait of the Prophet Mohammed as well as a complex allegory of theological sciences and liberal arts. On the entering wall the stories of Saint Peter Martyr provide the example of a life in pursuit of sanctity, and the Crucifixion is meant to strengthen the concept of the divine nature of Christ. The intricacy of the stories is understandable because the chapel was not accessible by the secular public, and the frescoes were meant to reinforce the principles accepted and supported by the cultivated Dominicans. The actual name of the chapel changed when a large Spanish community arrived in Florence, following the marriage of Eleonora of Toledo with Cosimo I Medici. Eleonora belonged to the highest ranks of Spanish aristocracy and grew up in Naples. The marriage was an important political alliance for the Medicis and Habsburgs alike, but it was surprisingly successful: Eleonora’s stunning beauty is evident in the many portraits that survive, and documents witness the bond of affection and respect with Cosimo. When in Florence she imported a lot of Spanish fashions and customs, and she was surrounded by Spanish ladies in waiting, pages, and nobility: For them she obtained the use of the Chapter, from then on named “ Spanish.”. The Spanish Chapel is part of the wide and fascinating complex of Santa Maria Novella, and hopefully part of your Florentine itinerary as well: take time to enjoy it.